Ghotit products offer a very advanced word-prediction technology known as Ghotit Quick Spell Word Prediction. Ghotit Quick Spell Word Prediction helps people with dyslexia and dysgraphia to write text quickly and correctly. It is designed for writers with typing issues and phonetic-based misspellings. The technology successfully predicts intended words. Corrections are offered instantly with the first typed letters of each word, even when the spellings of the word’s first letters are incorrect. In the example above a user entered the text “Help us to andesa”. 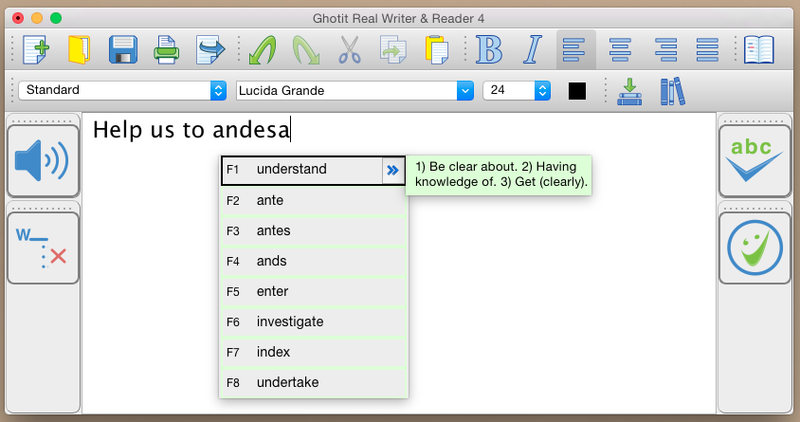 Despite the three spelling errors in the writing of the desired word “understand”, Ghotit is still able to predict correctly the word “understand”. In such cases that Ghotit is not able to predict correctly based on the first letters, just continue writing, Ghotit will eventually understand you and predict the correct word. Ghotit Quick-Spell Word Prediction combines phonetic and contextual algorithms with grammar-awareness. The prediction feature is offered in all of Ghotit products and available with desktops, laptops, tablets and mobile devices. Ghotit apps for iPad, iPhone and Android devices – all offer Quick-Spell Word-Prediction. The word prediction feature is equipped with reading aloud technology for each word and its meaning. Ghotit Word-Prediction makes easy for a person with dyslexia to comprehend each prediction and select the correct one. By providing a talking dictionary (meanings, explanations for predicted words) a user is able to distinguish even between homophones words written differently but pronounced similarly (i.e. “to” or “two”). Writing a text on a very specific subject sometimes requires a specific lexicon or special meanings for words used in specific subject domains. 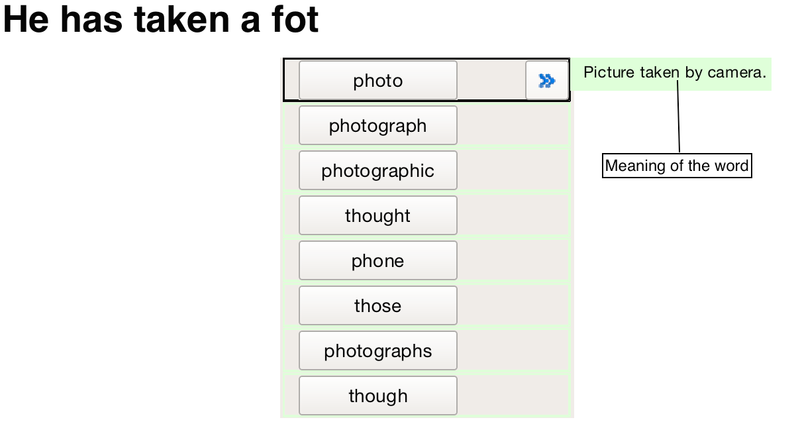 To improve the quality of Word-Prediction, Ghotit implemented Topics. Known alternatives to Ghotit Topics are commonly called Word-Banks. Ghotit Topics are superior to Word-Banks since the Topics contain not only words but also adopt a writing style suitable for the topic. Even if a Topic does not add a single new word to the Ghotit Dictionary, the Topic will improve the Word-Prediction and suggest predictions more accurately based upon the selected topic and the context of your writing.